Bhai Gurpal Singh Babbar was born on November 24, 1965. His father is Bhai Jagjit Singh and mother Bhupinder Kaur. Bhai Sahib had one younger brother as well. Bhai Sahib came from a very educated, rich, and prosperous family. Both of Bhai Sahib’s parents were teachers and taught at nearby schools. Bhai Gurpal Singh spent the first five years at Bhucho Mandi with his grandmother. Bhai Sahib’s entire family was Amritdhari for some generations and so he received his love of the Guru in his heritage. Bhai Sahib was very devout. He would go to the Gurdwara daily and listen to nitnem there and only then eat anything. Bhai Gurpal Singh graduated from high school in 1980 and then went to Punjab Agriculture Univesity in Ludhiana to study for his B.Sc in agriculture. He was very intelligent and attended school on a scholarship. Bhai Gurpal Singh’s love for Sikhi continued to grown and in 1981, he received amrit at the Ludhiana Smagam organized by the Akhand Kirtani Jatha. From that day he kept Sarbloh Rehit of the Khalsa. When he came home that night, on his shoulder he was carrying a boari, a sack filled with sarbloh battae and other vessels. He immediately took all the china and glassware and threw them in the garbage. Bhai Sahib told his parents, “We will cook and eat in sarbloh from now on. This is the Guru’s rehit.” Bhai Gurpal Singh began preparing his own meals. Before going underground Bhai Sahib generally wore the Khalsa bana, with a damala and chola. Bhai Sahib was very strong and had a good physical build. Bhai Sahib excelled in education was one of the most intelligent students that the University had ever seen. Along with their education however, the young Singhs at the university did regular sat sang at the university dorms. Many students were inspired by Bhai Sahib’s example. Bhai Gurpal Singh and other young Singhs used to learn gatka and martial arts and talked about being ready to serve the Panth. When doing let stretches for martial arts classes, Bhai Sahib and his companions used to take each other to the limits and joke about the police using the same methods for torture. Bhai Sahib had a very strict nitnem. Every day, beyond his seven bani nitnem, he would also recite Sukhmani Sahib, Baranmaha, and Savaiyay. He memorised 16-17 banis, At the Delhi Akhand Kirtan Smagam, Bhai Sahib took part in the Gurbani competition and won Rs. 960. He also won a similar competiton in Ludhiana. Bhai Sahib very much enjoyed doing keertan and playing joree. He had memorized about 50 shabads, Whenever he would come home, he would play a tape and play joree with it for practice. He would do his Rehras Sahib as keertan and would also do Asa Di Vaar keertan with great love. Bhai Sahib was a very good laridaar Akhand Paathi. To read shudh paath, he would consult with older Jatha Singhs. The Singhs in the Jatha respected him very much and he was greatly loved. When the yearly Ludhiana Smagam would come, he would abandon everything and do seva in the langar day and night. Even school would become secondary. Eventually the Ludhiana Sangat assigned Bhai Gurpal Singh the seva of preparing Degh. The seva of Degh is a very big seva and is given only to those Singhs who keep the strictest Sarbloh Bibek and also have a strong spiritual jeevan. At first Bhai Sahib was very inexperienced and the Degh did not turn out right. The Singhs gave him a tankhah. But by his keen interest and Guru Sahib’s blessings, Bhai Gurpal Singh became very good and was even nicknamed “Degha Vala Singh”. Bhai Sahib had total faith in Gurbani. He was dedicated to the principles espoused by the Akhand Kirtani Jatha and would go to the Jatha’s major Smagams in Amritsar, Anandpur Sahib, Delhi etc. Usually he could be seen sitting on stage play the khartaals. All night he would sit in one position, listening to the Rhensbai. Bhai Gurpal Singh’s every pore was filled with love of the Guru. He was very anxious to preserve the honour of the Panth. The 1978 Nirankari Massacre in Amritsar had a deep effect on his mind. Bhai Gurpal Singh felt that the Singhs had been brutally slaughtered and there was no justice to follow. Bhai Sahib felt the desire to serve the Panth so in February 1984, he left for Amritsar. Someone asked Bhai Sahib what would happen to his family, Bhai Sahib Replied, “We are two brothers in the family. Now treat us like there is only one” (Bhai Sahib’s younger brother is still alive today). Bhai Gurpal Singh’s father Sardar Jagjit Singh went to Amritsar and forced Bhai Sahib to return. He insisted Bhai Gurpal Singh continue his studies. Bhai Gurpal Singh returned but at this point began to secretly take part in operations against the Indian Government. Bhai Sahib felt that his sacrifice was needed to protect the Panth and fight against evil. He believed that the best way to use his life was to sacrifice it for the cause of the Guru. When Bhai Sahib’s family began to build a new house, he would say to his father, “What is the benefit of these bricks? The Panth is locked in life and death struggle and our money should go to maintain our Panth’s honour.” Bhai Sahib encouraged his family to give their Dasvandh to the Sikh Movement. Eventually Bhai Sahib went completely underground. Bhai Gurpal Singh Ji soon took part in big operations such as the rescuing of Bhai Anokh Singh Jee from the Ludhiana Court houses. He worked together with all organizations of Singhs. Bhai Sahib was always in Chardi Kala and had a tremendous nitnem. No matter what duty brought, he always did two Sukhmani Sahib paths before eating his evening meal. Singhs that saw him talk about the red-Gurmukhi glow that was present on his face. One Singh I talked to who did seva with Bhai Gurpal Singh said that Bhai Gurpal Singh could do Sukhmani Sahib very quickly and with great concentration. The Singhs used to talk amongst themselves and say that he was of a very high avastha and some Singhs even thought he was a Brahmgyani. Bhai Sahib became central to the operations conducted in the Malwa region. In early 1987 Bhai Sahib came to see his parents. Bhai Sahib asked his father to do Ardaas that his Sikhi would last intact to his final breaths. Seeing his mother very sad, Bhai Sahib said, “Guru Gobind Singh Ji sacrificed his four sons for us. We are two brothers. Can’t you give just one son to the Panth?” Bhai Sahib asked his family to have his final rites performed by Rehitvan Singhs from the Jatha. “Vaahiguru Jee Ka Khalsa Vaahiguru Jee Kee Fateh! By Guru Akaal Purakh’s supreme grace, I am in total Chardi Kala and Anand. I have no troubles at all. But I am sad about one thing that you are all depressed. But at the same time I was glad to know that Father is in Chardi Kala. There is no reason to be depressed. I wanted this fate. You can certainly be depressed, weep and wail if I ever betray the Panth, or act like a coward or if I commit any immoral crimes. And please do weep the day I give up my weapons before this evil government. But if by the grace of the Satguru, like countless of my brothers, I am successful in breathing my end with my kesh and Sikhi intact, then please do not weep. Read Bani and jap naam and do ardaas before Satguru that he lets us pass this exam with his grace. Countless others die. Some die by taking drugs, others die in countless honourless ways commiting shameful acts. Be grateful that Sachay Pathshah has brought your son to his side. Our love exists only if you stay in the limits of Sikhi and talk about love of Sikhi. Everything else is fine. There is no need to worry. Every day you do paath and know that Dukh is medicine and Sukh is a disease. Please give my roaring Fateh with hands clasped together to [all family members and acquaintances]. 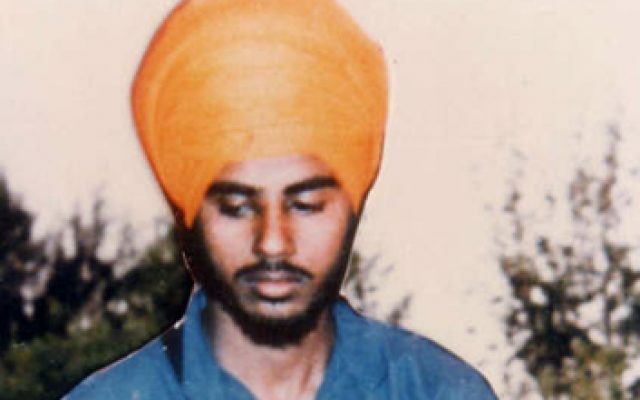 The time Bhai Gurpal Singh Babbar was eagerly awaiting finally arrived on Monday May 11, 1987. Bhai Gurpal Singh had found out that another prominent Singh in the Movement, Bhai Jarnail Singh Halwara, the assassin of Harchand Singh Longowal, had cut his kesh in order to conceal his identity. Bhai Sahib was firmly against compromising Sikhi to save one’s life. He decided he would go meet with Bhai Jarnail Singh and encourage him to keep his kesh again and get peshed at the next possible Amrit Sinchaar. Even in the thick of battle, with the Indian Security Forces hot on his trail, Bhai Gurpal Singh was willing to take a risk to help a fallen brother on the Path of Sikhi. Bhai Gurpal Singh and another Singh met Bhai Jarnail Singh at village Haripur in Sangrur. They had a long discussion and decided to spend the night at a small hut in the fields. Somehow the Security Forces received word that these most wanted Singhs were in the area. Bhai Sahib had risen for Amrit vela when at 4am, the hut was surrounded Bhai Sahib heard some noises outside and immediately knew what was happening. They came out fighting and after a heated battle with the police, Bhai Sahib and Bhai Halwara were silenced. Bhai Gurpal Singh took the bullets in his chest and did not run. When he fell, Guru Sahib did one final kirpa on his Shaheed: Bhai Gurpal Singh’s head rested on an elevated water canal. Even in death, Guru Sahib did not let his Singh’s head bow before the enemy. Bhai Sahib’s family was not aware of the Shaheedi until some days later. They finally found out about the Shaheedi from someone who mentioned seeing a picture in the newspaper. After their Shaheedi countless Singh’s gathered at Bhai Gurpal Singh’s house and did an Akhand Paath and Akhand Kirtan, which was done in great Chardi Kala. The village of Halwara made a new Gurdwara in honour of Shaheed Bhai Jarnail Singh Halwara. In Bhucho Mandi even today there is a Gurdwara Sahib that has the pictures of Bhai Gurpal Singh Babbar and is kept in his memory (though the name of the Gurdwara has been changed since). Bhai Gurpal Singh Babbar was a Chardi Kala sarblohi warrior. Even today his family keeps his old batay as his momentos. Bhai Sahib sacrificed his life in the highest of Khalsa traditions in order to fight against oppression and to maintain the honour of the Panth. When the Panth needed his head, he did not back down. Bhai Sahib’s example is one that we can all learn from today.